Massage therapy is recommended by medical practitioners as it is one of the most effective ways to comfort one’s exhausted mind and body. It aids in soothing and dodging back and neck pain. It is obvious that one needs to pay a pretty penny for a relaxing massage. Instead of throwing money for expensive massages, it would be a wise man’s call to own a chair to overcome fatigue and tiredness. This stress-busting massage chair includes health benefits like improved blood circulation, spinal realignment and much more. Apart from assuaging body pains, a massage chair can be a spellbinding seat of mental peace. One can escape the world and usher in their peace of mind by putting on their thinking cap while meditating on a full body massage chair. These days, massage chairs have been elevated to a new level. The advanced technology of present massage chairs is so refined that they make an impression of a professional therapeutic masseuse’s hands. Some functions are zero gravity recliner, tapping and airbag massage. Where you place your massage chair might be the last thing you would think about but it is very important to anticipate the space it would occupy. As most modern massage chairs accommodate full reclining, the massage chair will take up length from head to toe. Going by the old saying, you get what you pay for, one should bear in mind that buying a massage chair from a renowned brand will bail you out from spending a top dollar in future for repair and maintenance. It is advised to dodge cheap models and invest in quality massage chairs which are promising. While these are the grounds for determining the right one, there are some important features of a massage chair that will aid and abet in determining the full body massage chair who wish for. Technology: Many new technologies have made an entrance to elevate the overall body massage experience at home. A full body massage chair with the latest technologies, such as 2d, 3d, and 4d rollers with a broad spectrum of varieties suiting your budget can be availed from us. Rollers: Rollers being an obvious part of the massage chair, ghosting a massager’s hand have kicked in with the latest improvisation. In today’s market, full body massage chairs with 4,6, or 8 rollers have emerged, giving a soothing back rub. Some chairs take care of your tired feet and have rollers below for a relaxing foot massage. Airbags: Airbags are included to reach out the places rollers can’t. And it is as apparent as a nose on the face that more airbags add up for a luxuriating massage. Heater: Adding warmth to a body massage would take your relaxation to the next level. We append these heaters to the rollers, enabling the cozy warmth reach most of your body. Auto Massages: With preset auto massages comforting anyone, you can ease up your body with one tap. Warranty: It is obvious for you to be concerned with the lifetime of this relaxing equipment. And having a promising warranty will blanket your doubts. Our brand is one of the best in the market and provides you with a 3-year warranty. 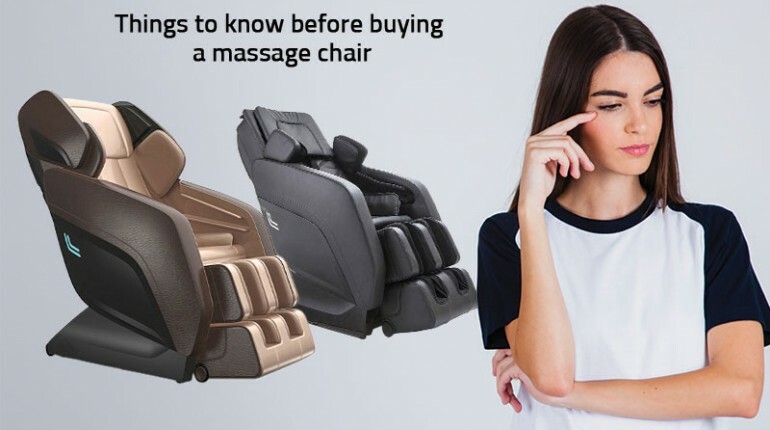 Now that you are informed about some important things you need to know before purchasing a massage chair, you’re all set for bringing home this blissful massage chair and just relax! What can be better than a New year goal of being stress-free? ?